This large and heavy round bowl is from Dirwood's "End Of Day Glass®" series which means it was made with the left over color chips used throughout the day. It contains shades of blue, pink, aquamarine, gold, red, purple, green and more. 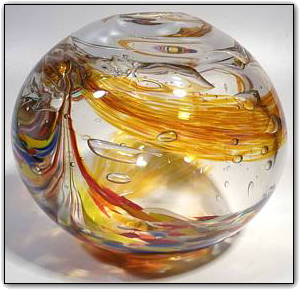 The glass is over 1/2" thick and the piece weighs over 14 pounds! Although it appears in the pictures to have a rough surface, that is all under the outer coat of smooth and clear glass. People will look at this and wonder how it was created. Make sure to zoom in to see the breathtaking detail in color and texture, and it looks even more impressive in person!